As a freelance illustrator, naturalist, and dog owner, escaping my home office and exploring beautiful (and dog-friendly) hiking trails is high on my list. I’m lucky to live in Oakland California, which is home to incredible, diverse landscapes that I can reach in under 20 minutes. One of my favorites is the Serpentine Prairie Trail in the Redwood Regional Park. I love going an hour or two before sunset when the light is golden and the prairie practically glows. 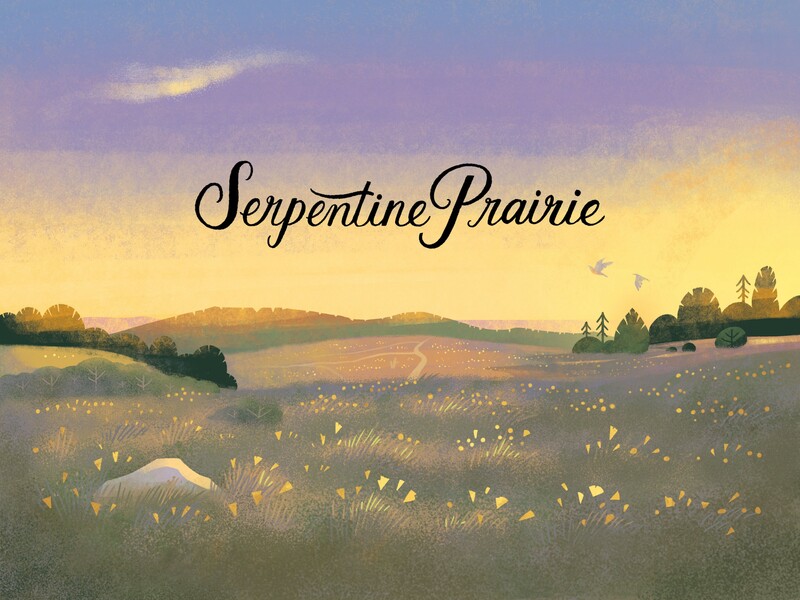 So what is a Serpentine Prairie, exactly? Naturally occurring serpentine rock creates soil that is very low in nutrients, giving rise to a unique set of plants that can tolerate the extreme soil condition. The soil has a light blue hue to it, which you can see in exposed areas of the trail. This particular serpentine prairie is home to one of Northern California’s richest arrays of native plants. 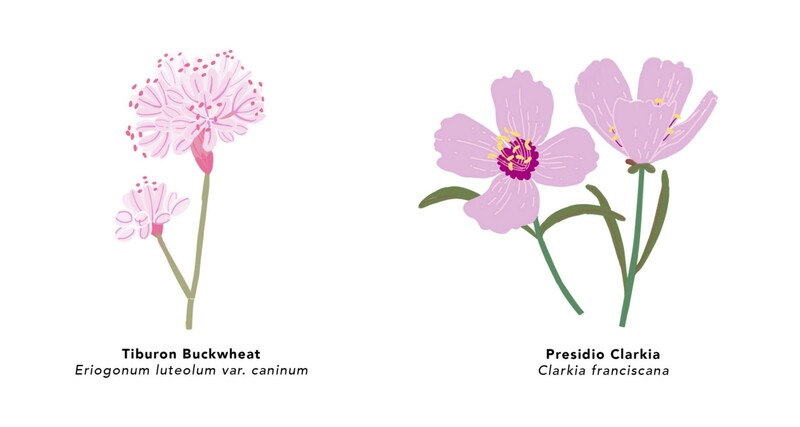 This small area contains 17 species of California native grasses, including the rare plant, Tiburon buckwheat, and the endangered Presidio clarkia. Spring is the best time to visit, as there is an explosion of poppies and other wildflowers. The view here is spectacular — in one direction, you can see the tops of coastal redwoods, mixed evergreen forest, chaparral, and grassland. 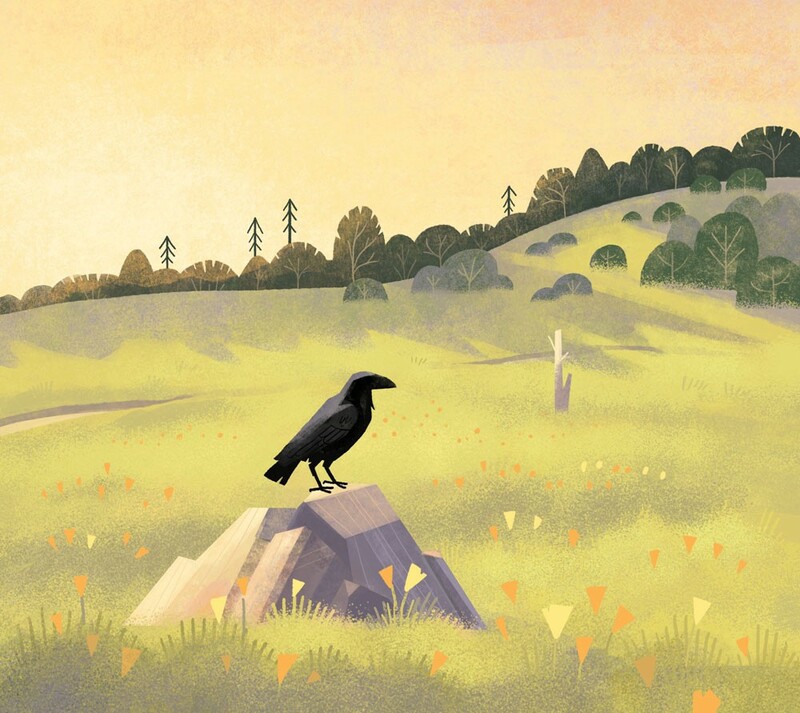 In the other direction is the bustling city of Oakland, but you wouldn’t know it since all you can hear is the wind through the grass, the croaking of ravens, and perhaps the chatter of a Western Bluebird. Visit now and you might also catch a glimpse of these iconic Californian flora and fauna. Serpentine rock happens to be California’s state rock so it’s one of the few areas you can find all of these state symbols in one place! 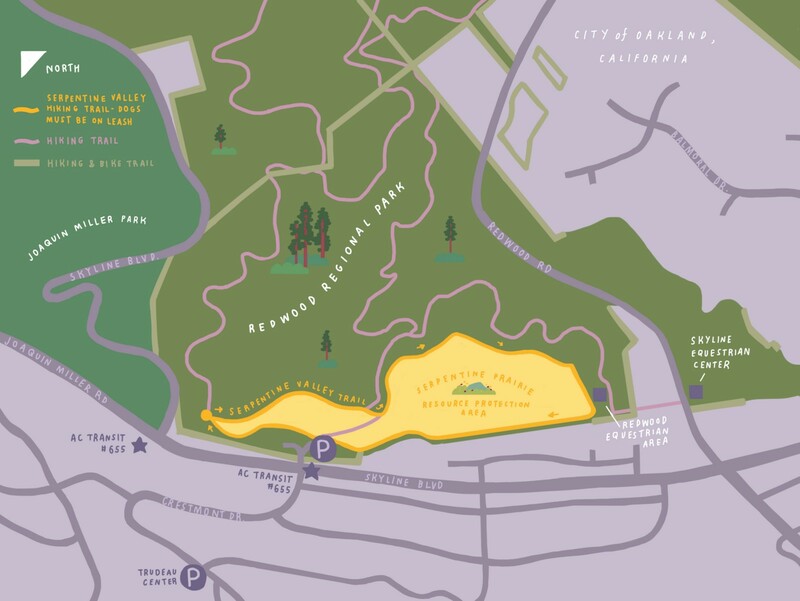 Access the Serpentine Prairie trail from the parking lot at 11500 Skyline Blvd, Oakland, CA 94619. The trail is an easy 0.7 mile saunter, so take your time and get a close look at everything it has to offer. It’s dog-friendly, but please be a considerate of the designated Resource Protection areas and pick up after your pooch. Trashcans are located at the parking lot, a short walk to the left of the lot, and near the entrance to the Dunn Trail. If you worked up an appetite after your walk, stop by Monaghan’s dog-friendly back patio for a relaxing glass of wine or beer and some bar bites. The restaurant is located at 2820 Mountain Blvd, a quick 4 minute car-ride away from the trail.